Flowers are magical. The first thing I photographed with my first camera was a flower in my yard. It was the perfect subject because it was beautiful, colorful, and it didn’t move around. I sat there practicing on it every day, trying out all the camera’s settings and learning how they affected the pictures. Today, I still love photographing flowers, and I’ve got one tip you should always use when photographing flowers. Flowers are colorful, but they are also translucent. When light shines through a flower’s petals, a whole new territory of tone is added to the color. You’ll see different densities of shadow where petals overlap, and the silhouette of the stamens and pistils (the inner parts of a flower) can appear intriguing and sensual. Move your camera around until the sun is shining through the flowers and you’ll enjoy a completely different experience than shooting with the sun behind the camera. Plus, you’ll find that there’s more often a dark background when the flowers are backlit, further setting them apart. Lumix GX8, Lensbaby Edge 50 f/3.2 lens, f/5.6, 1/1000s, ISO 400. Lumix GX8, Lensbaby Edge 50 f/3.2 lens, f/5.6, 1/640s, ISO 400. What’s more, sunlight through the petals softens the light. If you find the backlight, then soft sidelight is just around the corner. 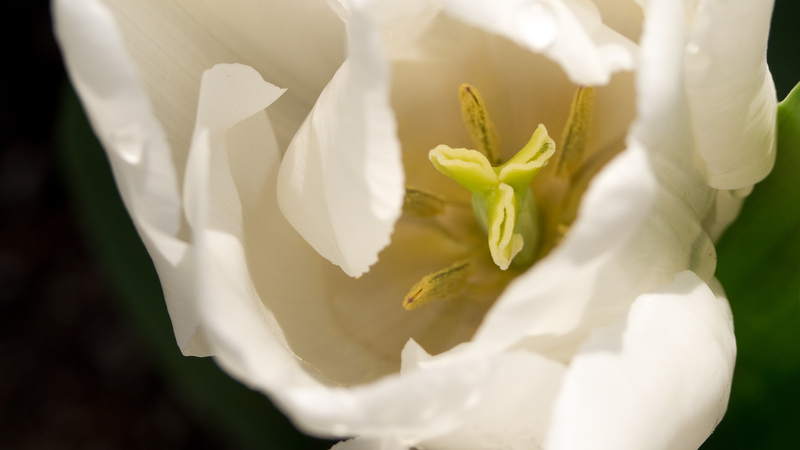 The sun was shining gently through the petals onto the pistil and stamens of the white flower below. Compare that with the red flower illuminated by the direct sun. There’s too much contrast on the red–it looks like it was shot at noon (it was), but the white flower appears to be more controlled and contemplated. They were planted next to each other and photographed moments apart. Always backlight flowers. he soft sidelight will be more apparent once you’ve got the backlight down pat. Oh, you should photograph them other ways, too, but backlit will always produce lovely results and get your creativity stimulated to help you make the most of your flower shoot. Great tip… Thanks for the share! !